Everton took a big three points off Arsenal, with Ashley Williams's late goal and heroic late defense the difference for the Toffees. Everton came back to defeat Arsenal 2-1 Tuesday, with Ashley Williams's 86th-minute header and heroic late defending the difference at Goodison Park. Arsenal had taken the lead in the first half through Alexis Sanchez, whose free kick was deflected in for the opener. Everton leveled through Seamus Coleman just before halftime, though, setting the stage for a tense second half. Everton took its first lead through Williams, the summer signing from Swansea City, as he headed Ross Barkley's corner kick down and past Petr Cech. Arsenal had its chances to pull even, none better than a wild sequence in the Everton box in stoppage time. It began with a diving header attempt from Cech, then continued as Maarten Stekelenburg was first to the ball off an Alexis cross following his previous save. With Stekelenburg out of position after diving for the ball, Arsenal then sent two shots toward the vacant goal, only to have them both blocked by Everton defenders Leighton Baines and Ramiro Funes Mori. It was relief at the final whistle for the Toffees, while Arsenal lost for just the second time in the league this season, with the other coming in another wild affair, a 4-3 loss to Liverpool on opening day. Arsenal remains in second place in the league, three points behind Chelsea, which plays last-place Sunderland on Wednesday. Everton, which had Phil Jagielka sent off in stoppage time, climbs provisionally into seventh. Leicester City had its momentum stalled following Saturday's 4-2 win over Manchester City, with the Foxes falling to Bournemouth 1-0 on Tuesday. Leonardo Ulloa was tantalizingly close to scoring an equalizer in the 91st minute, but Artur Boruc denied him with a stellar diving save to preserve the win for the surprising Cherries, who are up to eighth in the Premier League. Reigning champion Leicester, meanwhile, is five points behind in 14th place, still looking for that purple patch of form that resembles last season's title run. Marc Pugh opened the scoring for Bournemouth in the 34th minute with a fantastic volley after a rebound of a saved shot fell his way. 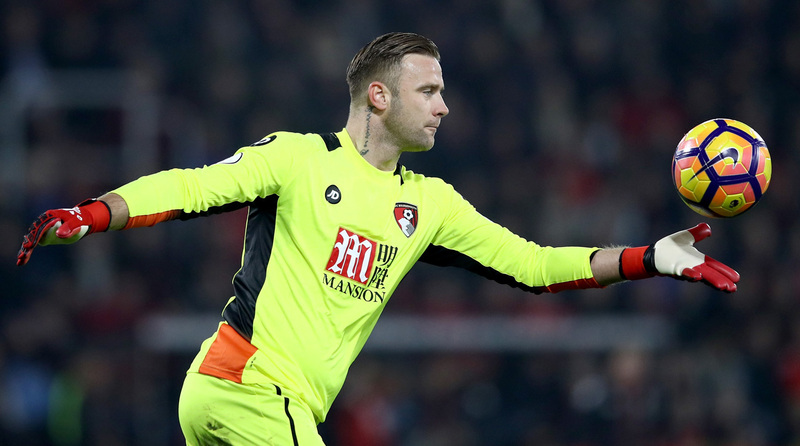 Boruc made sure that was enough to secure the three points, with his instinctive stop preventing Ulloa from getting on the board from six yards out. Leicester will look to get back on track Saturday at Stoke City, while Bournemouth remains home for Sunday's showdown against Southampton.